This engine has an interesting pedigree. Originally introduced by Matthew Murray in 1802. It was one of a number of engine designs produced after the Boulton and Waft patents expired. It could be classified as a portable engine, in that it was not house built, being self contained it could be erected anywhere. It was of about 5hp and was condensing, working at a low pressure. 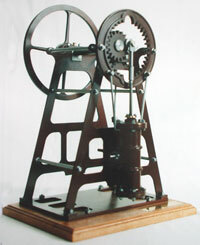 A unique feature of the engine was the hypocycloidal motion, whereby reciprocating motion was transformed into rotary motion. The geometric principle is that a point on a circle rolled around the inside of another circle of twice the diameter will scribe a straight line. In practice the small circle is a spur gear which rolls around inside a ring gear with internal teeth. As the piston rod rises and falls, the end is pivoted on a pin fixed on the periphery of the small gear. The small gear rolls around and through a crank drags the crankshaft round. The model is based on a later engine than Murray’s original. It was built by John Bradley and Co (Stourbridge) Ltd and is in the Henry Ford Museum at Dearborn, Michigan. It was used for pumping water. In the model the pump is not included, the desire being to show only the hypocycloidal mechanism. Another engine from the same company but possibly of earlier design is in the Birmingham Museum of Science and Industry. One reason for choosing the prototype was that it had cast plate frames and base. This has lent itself to reproduction by laser cutting, the same method being used to provide the gears and flywheel. The flywheel has only four spokes and these are quite thin, which made the possibility of having them cast doubtful. The cylinder, covers and steamchest are gunmetal castings. There are 19 A4 drawings in the set plus a parts list. All dimensions are in both metric and imperial. The engine can be built on a 3½” lathe, though not essential, a milling machine will make things easier. The engine was serialised in Engineering in Miniature from October 1996 to June 1997. It is a most fascinating engine to watch in motion.